I found this poster on Bedford Avenue last weekend when I was playing ‘tour guide’ (for my mother and cousin). 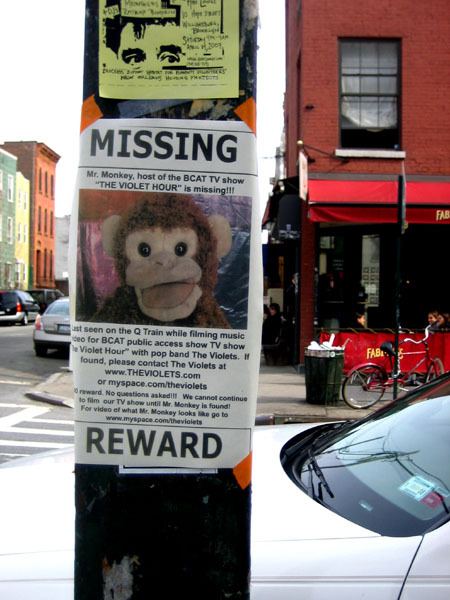 This is either a desperate attempt to recover a plush monkey emcee or it is the one of the most brilliant examples of viral marketing I have ever seen. (The fact that he was last seen on the Q train is a nice touch.) If they put “Missing” photos like this on milk cartons I’d be a helluva lot more likely to read them. (Yeah, hell holds a special place for me.) Either way, I felt this deserved dissemination to the general public. If anyone out there has seen “Mr. Monkey”, please contact the fine folks at The Violet Hour. He is clearly missed.